Brett White had a great two part interview with Jeff Lemire, the writer of Extraordinary X-Men. As much as I’m not crazy about Colossus, him and his sister, Magik, being on the team, guarantees that she should get plenty of panel time. I really like Humberto Ramos experimenting with his sytle, as that is an awesome cover for issue six! 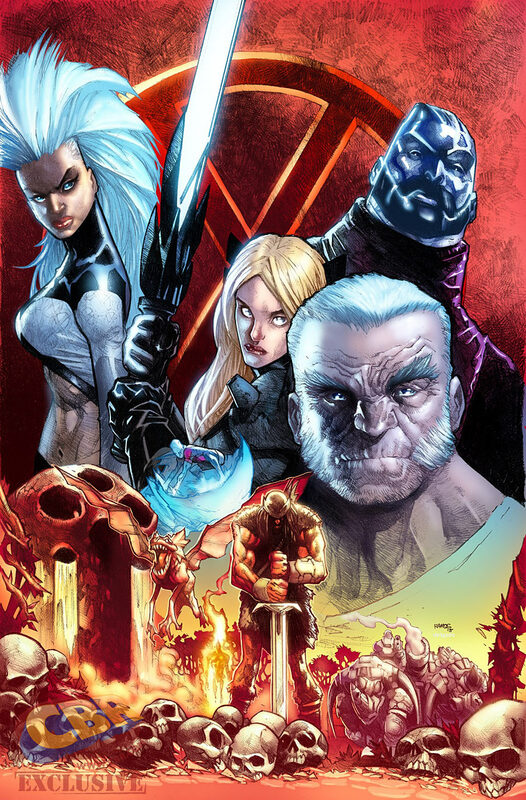 It really is the A-List title, with the roster of – Magik, Storm, Nightcrawler, Old Man Logan, Teen Jean Grey and Colossus. There is a question posed about if Banshee will be appearing in the title, I thought he was back in the realm of the dead, after that Apocalypse Twins storyline in Uncanny Avengers, wherein he was the Horseman of Death, one of them. Apparently, that storyline ends with Banshee being taken in by the X-Men, to start the long healing process. I like that Magik is going to get her own spotlight storyline, I’m really looking forward to that! It also sounds like she won’t be as glib as she has been shown to be, in the past. Kitty Pryde is on Lemire’s list of characters he hopes to write, one day, he does say that he has got to write a few of them, so maybe we will see her within the pages of these series. We are definitely going to be getting an X-Men / Inhumans crossover, even if Marvel hasn’t hinted or announced it. Sinister is the villain of the first arc, that doesn’t excite me too much. Lemire is a huge Kitty Pryde fan but won’t be able to write her, for the first couple issues. He references that she is in a couple titles so I wonder what her other title is? Storm is the new leader of mutants, which makes sense with the other players off the board. Not too much is revealed, in either interview, but these interviews are part of the hype factory and it is nice to see interior art. It’s a shame Kitty won’t be in “Extraordinary X-men”. I like to see her be written as a flawed character, and writer Jeff Lemire isn’t afraid to show how flawed characters can be. I’m not that familiar with Lemire but if that is true, that team is has plenty of flawed characters for him to shine on. I’ve just read the “Extraordinary X-men” issues and I was pleased on how Jeff Lemire wrote Illyana. She’s not the demonic anti-hero the way she’s written here and most people don’t know how humanizing Illyana is. She truly is a versatile character, he has a great grasp on her. I really do like fun Illyana, especially after years of a mopy or sad one.